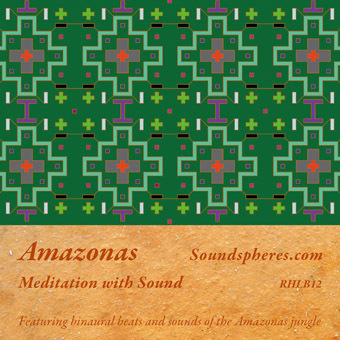 The recording Amazonas is a tool for relaxation and meditation. It features brainwave entrainment with binaural beats. The human brain has the ability to construct a subsonic beat when fed two different tones, one in each ear. The frequency in cycles per second of this beat, generally subsonic, equals the difference between the two close frequencies. The brain has been found to entrain, or adjust its electric activity to this outside stimulus. As different subsonic frequencies are associated with different brain states - waking, dreaming, meditative states etc, the sounds you hear in headphones will gradually lead your mind to more relaxed states. Amazonas employs theta (track 2, 8-4 Hz) and delta waves (track 3, 3-1 Hz), associated respectively with meditative states and deep sleep. Track 1 Earth is a short lead in, or rather lead down to an attentive receptive state of mind. During this track you can simply relax in a comfortable lying or sitting position with back straight. Also you can take the opportunity to adjust the volume to a comfortable non-invasive level. Track 2 Air, is a 18 minute relaxing excursion into the Amazonas jungle with sounds of crickets, birds, frogs and monkeys lingering in the background, recorded in the Ecuador jungle. Track 3 Water is a 40 minute voyage from where track 2 left off down to perfect stillness. Distant whistling vessels can be heard during the first half of this track; a reminiscence from ancient Inca civilizations. Should you have any doubt about listening because of a medical condition please consult your physician.